Wow, it's the middle of March...how did that happen! It seems like just the other day we were taking down our Christmas lights! Spring is officially here in Portland, and I can't tell you how nice it is to get out of work and still have it be light out! It's still a bit early for much to be blooming in my garden, but a quick look around yesterday morning found a few surprises. The most noticeable blooms at the moment are the Daffodils. Amusingly, I actually didn't plant any of these...they are remnants of the previous owner's plants. This is the first time these doubles have bloomed since we've lived here. They were previously covered up by a Euonymous shrub that I removed last summer. As with most plants, however, I prefer the singles. 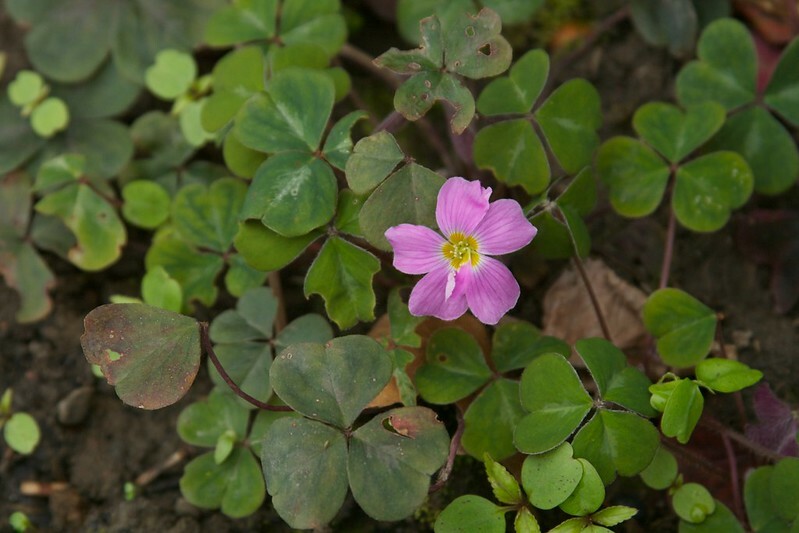 I was surprised by this vibrant pink Oxalis bloom the other day. Why, oh why, have I waited so long to plant Crocus? They take up no room, bloom brilliantly, and then disappear just as the rest of the plants take over. I think I like this white/purple Crocus best...sadly, so do the slugs. The Forsythia on the right is one of the other shrubs that came with the house. 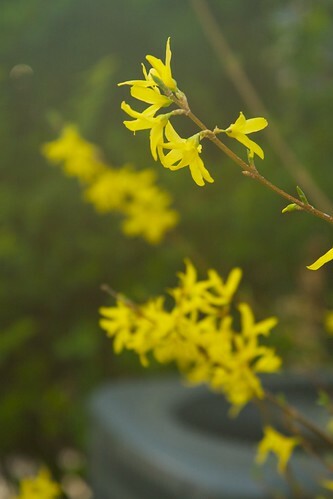 The Forsythia in our neighborhood right now are a riot of golden color. Sadly, I'm awful at pruning (seriously, my least favorite thing EVER) so this poor shrub is in a constant state of "bad haircut". While this is more of an "almost" bloom, I'm so excited to see the Mukdenia 'Karasuba' I planted last year looking so happy. I'm hoping it likes the spot it's in. I'm not entirely sure what variety of Clematis this is, it belongs to our neighbor, but is covering the fence between our properties. It's a dull, boring thicket for 11 months of the year...an then a glorious, glowing mass of blooms for a few weeks in early spring. And now, for a pre-emptive Foliage Follow-Up! One of the constants in my garden, Anementhele lessoniana. I just love it's ever-shifting colors during the year...and it's graceful form. I leave you with some of my favorite new foliage at the moment, Persicaria 'Purple Fantasy'...love it! For more blooming goodness around the world, visit Carol at May Dreams Garden. For more Foliage finery, visit Pam at Digging! There are definitely not enough of your wonderful pictures in this post! I'm still waiting on Daffodils and Forsythia, but my Mukdenia seems to be in exactly the same pre-bloom state as yours. Hahahaha...I know...that's the mixed blessing of this time of year, there aren't as many things to take pictures of, so it's really easy to do the posts...but they aren't quite as fun as those summer onces, are they? I'm right there with you on the crocuses. Why is this the first year I planted them? I love your double daffs! Seriously...why did we wait so long...I love them! That's it...I'm adding crocus to my garden! Your photography inspires me. Happy spring to you! 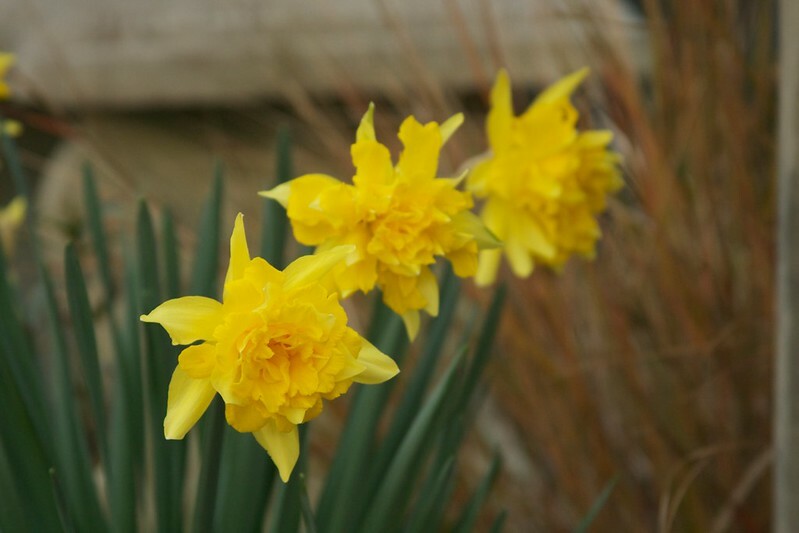 Do you know the name of the daffodil? It is very pretty. I'll take some of that Persicaria 'Purple Fantasy' -- wow! I added my first two Persicaria last fall, and I think you've going to make me hunt down several more. Love the two foliage shots at the end best of all...but I wouldn't be upset to find a couple of those double daff's in a vase on my desk! It's kind of crazy, right! The Persicaria are growing at a crazy rate this year! Very nice choices. That Persicaria Purple Fantasy is gorgeous. I so love pretty foliage plants. I agree...I'm really loving 'Purple Fantasy' so far! You're right...I don't know why I can never remember that! Love the Persicaria shot! They're so beatiful when they're first emerging. Well, they're sweet the rest of the season too but there's something special about them when they're young. The white and purple crocus is gorgeous; I must add some to my garden this fall! Happy GBBD! I totally agree...that first foliage of Persicarias is SO intensely colored. I wish it was that way all season...can you imagine! I've never seen mukdenia blooms -- interesting! I have only seen pictures of the beautiful foliage. It's a plant I want, but I have so little shade. I hope to see more of yours as it leafs out. I'm jealous how far ahead you are -- spring is a distant thought here in New England, although snowdrops are up. Delighted to hear I am not the only gardener who is less than perfect in the pruning department, I just gave a climbing rose away because I just knew I would never keep it under control, whereas my neighbour will make it look amazing. Crocuses are my favourite Spring bulb, they take up so little room and are so varied. beautiful photos as ever. Happy GBBD! Hahahaha...you are in good company, Janet...I'm hopeless at pruning! How exciting to see the garden come back to life! I haven't heard of mukdenia...must go look that up! 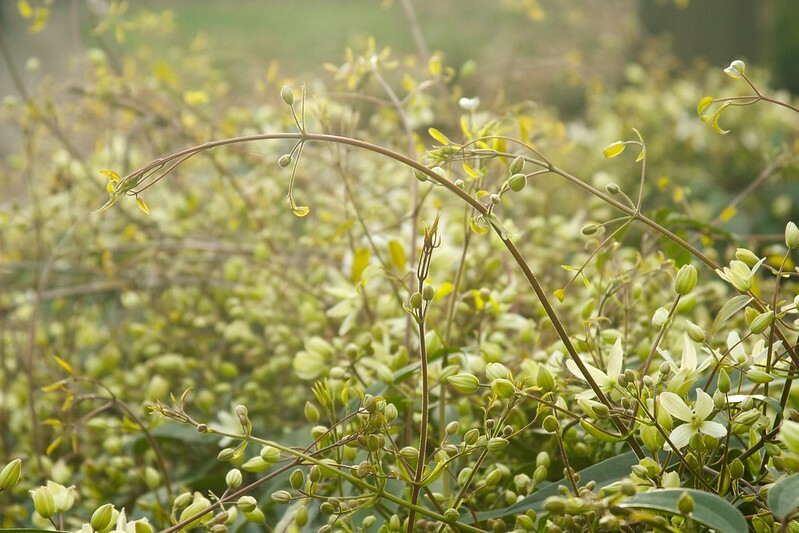 Could the clematis be armandii? I have one and it grows intertwined with a climbing rose on an arbor; it's in bloom now here too. You're absolutely right, Leslie...Clematis armandii...I don't know why it always eludes me! 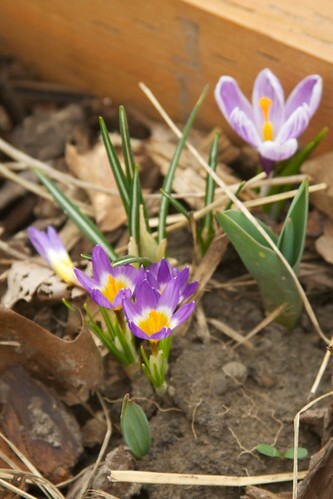 Crocuses are a favorite here too... we have that purple and yellow-centered one in our circle lawn. So nice to see them every spring! Crocuses are so pretty...I'm totally adding more next year! Purple Fantasy! Learn something new every day!!! I love the Clematis. Waiting for mine at the house to bloom. They are starting too. Happy GBBD! Hahahahaha...I know...who names those things! 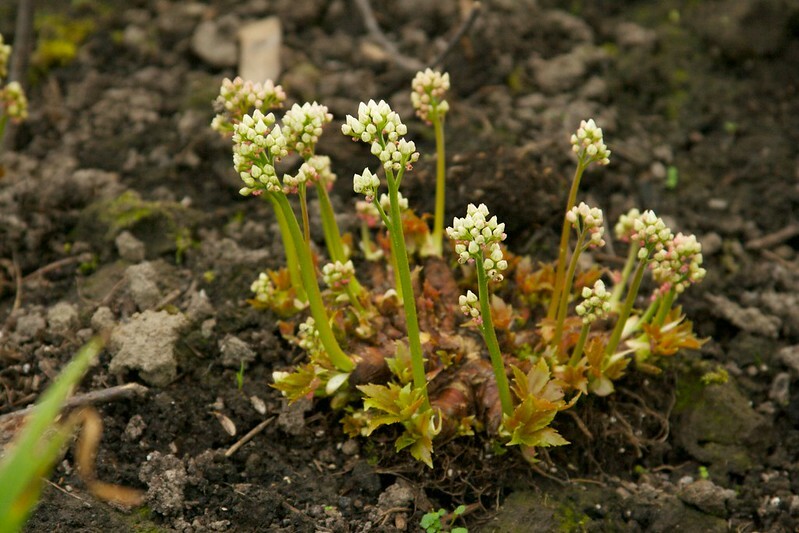 You definitely have signs of spring in your garden. We are a little behind last year this time and the crocus and hyacinth are just coming up. I love your purple crocus and Forthysia blooms and am looking forward to your garden photos in the upcoming season. It's really starting to ramp up, Lee...can't wait! I think we are a tad behind where we were last year...but who knows what's "normal" anymore, with the weather so crazy. 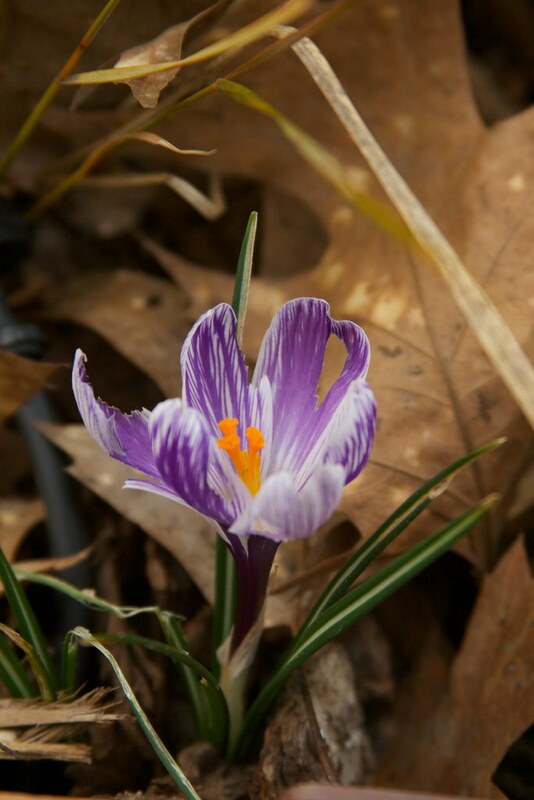 Love the color and striping on that crocus! Also the Clematis and the Anementhele. Aren't Crocus awesome! The Anemanthele is a fave! I feel the same about the crocus , I want them , lots of them them! I'm totally going to...and I hope they spread around a bit...they're supposed to naturalize, right? Hi Scott, I enjoyed seeing what you have blooming so far. I love your little almost blooming plant. It's one I haven't heard of. I think you'd really like that one, Sue! I always remember you not only with excellent photos, but also someone who loves the grasses, and I am sure a grass will always get into a post. We have lots of grasses too but somehow i haven't shoot them more often. I am amazed also that an Oxalis with similar leaves grow there too, however it is full yellow here! I would also love to have that pink. Oh yes, Andrea...we all have our vices, don't we...and mine is grasses! Yellow Oxalis...post a picture! 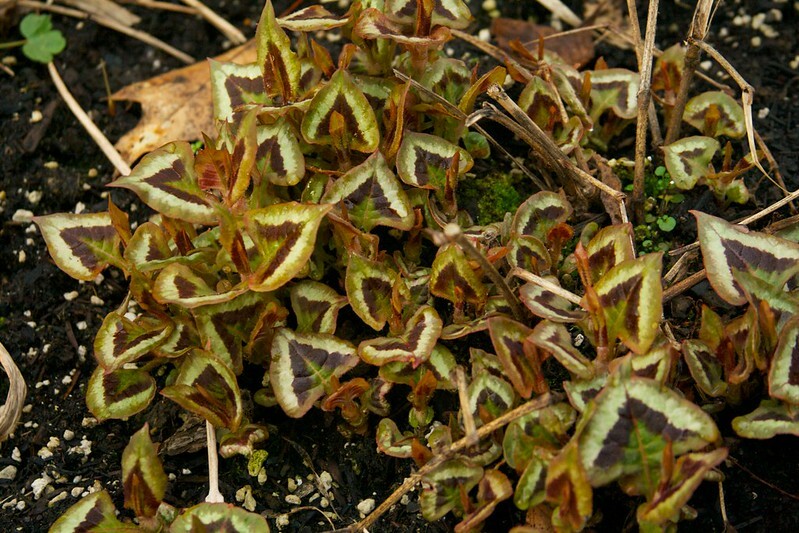 Since I'm always on the lookout for plants with maroon and puple foliage I had to google the Persicaria. Seems it's related to 'Red Dragon', a plant I covet but will not come back for me. 'Purple Fantasy' looks definitely to be worth a try. Daylight after work is the best and it only gets better. Happy GBBD! It's very similar to 'Red Dragon', but much (MUCH) smaller! May I add a link to your blog on mine ? Great thanks ! Scott your garden makes me think of my spring garden which is missing right now with our snow in the NE...soon though I will see those lovely daffs here too. Oh no! I admit, I feel guilty gushing about spring, while knowing that it's still snowing in other parts of the country...yikes! I hope you can find it...it took me forever (found a few at Dancing Oaks Nursery)...good luck! Scott, I'm always amazed at what we see in the garden right now, that which is beginning to emerge, and the Daphne fragrance that hits you when you don't expect it. 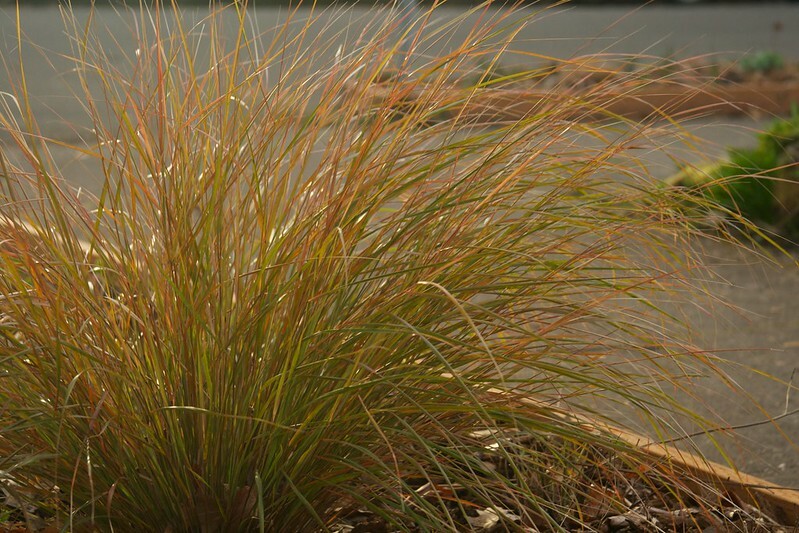 I love your Anementhele lessoniana; it reminds me of the brightness of the Carex flagellifera's color. Isn't that Daphne perfume amazing...especially since, exactly as you mentioned, it just randomly hits you...and you whip your head around, looking for the source! Your Portland spring is a little ahead of us. The new foliage on your Persicaria is so cute. I will have to go look at Red Dragon to see what it is doing. You inspired me and I did find Persicaria Dimity this year, so I hope it will grow enough to bloom. I hope you like Dimity...it's so cute! I just posted another post on the results! I love daffodils. My bed in the front yard is so small that I only grow the dwarf ones. Glad you have some flowers this bloom day. Looking forward to seeing your garden in the upcoming months. 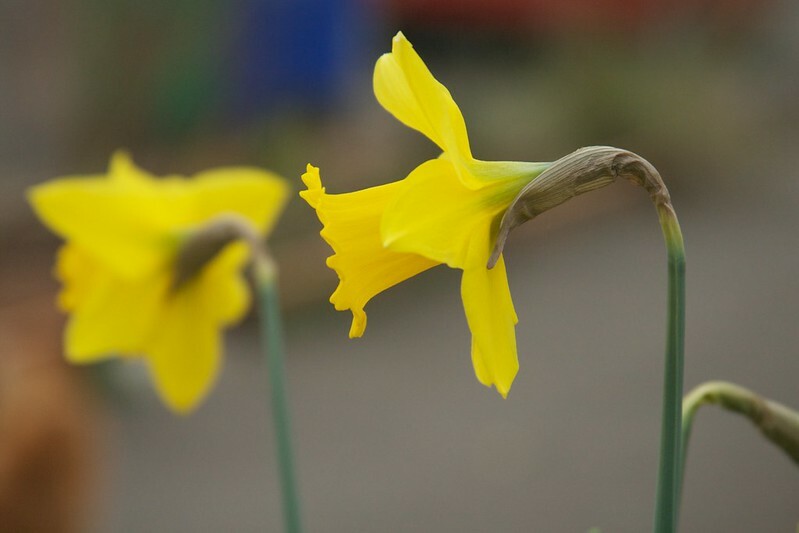 I actually think I might plant some dwarf Daff's next year...the bigger ones tend to flop over the minute it rains! If I could write in green I would - so envious of that Purple Fantasy - fantastic. HAHAHAHAHAHA...that Purple Fantasy would look smashing in your garden! WOW! Would you believe that your garden is further along than mine, in Spain? The daffodils are just starting to open up, and the forsythia still has a way to go. Your persicaria is quite interesting - never heard of it before - but my favorite is the armandii (I think mine is dead...).